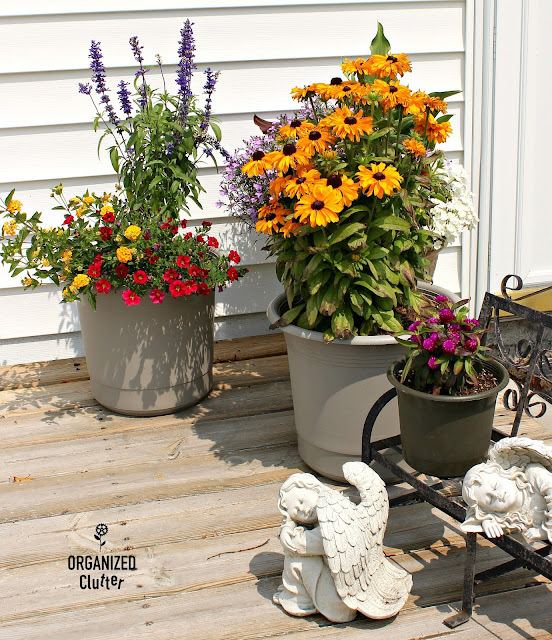 Today I am sharing my cousin Susan's flower border and container gardens. 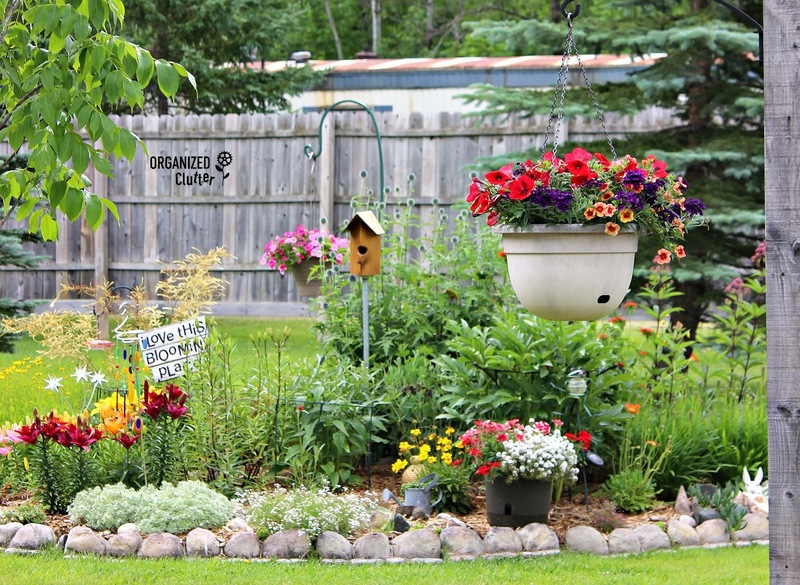 While Susan is not a junk gardener, she has a real knack for garden design and art. I hope you enjoy the tour! As you approach Susan's flower bed, you are met with a mixture of perennials, annuals, and garden art/decor. The edging is a faux rock edging that I have always admired. It has encircled Susan's garden since 2003. 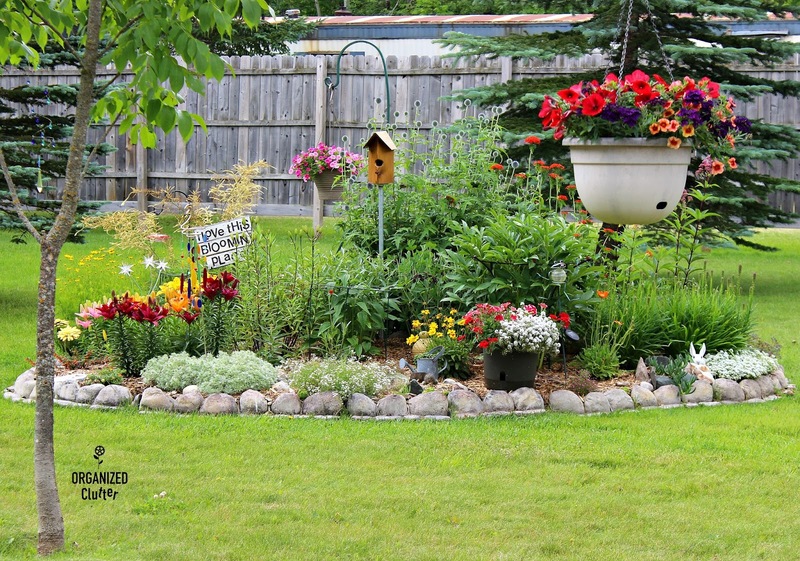 I have always thought the edging was realistic looking and has really held up well over the years. I don't think this particular edging is still available but new ones are available to finish off your garden border with style. 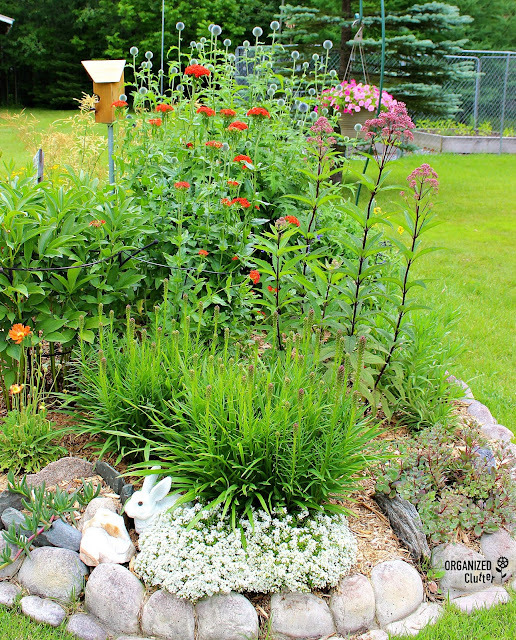 Behind the white alyssum at the bottom of the photo, is a liatris, not yet in bloom. Next on the right is a Vera Jameson sedum. 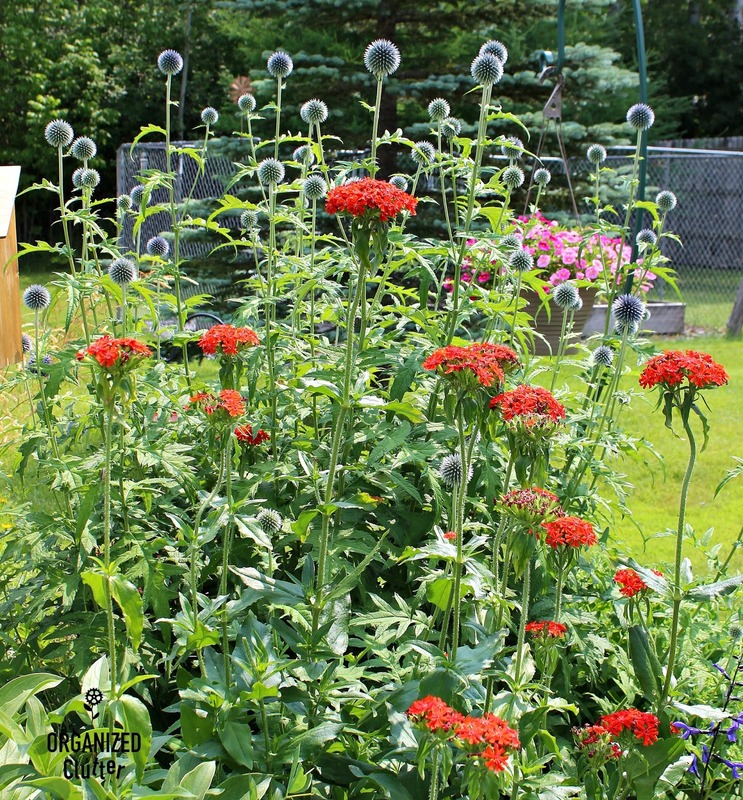 The orange red blossoms belong to the perennial plant, Maltese Cross. 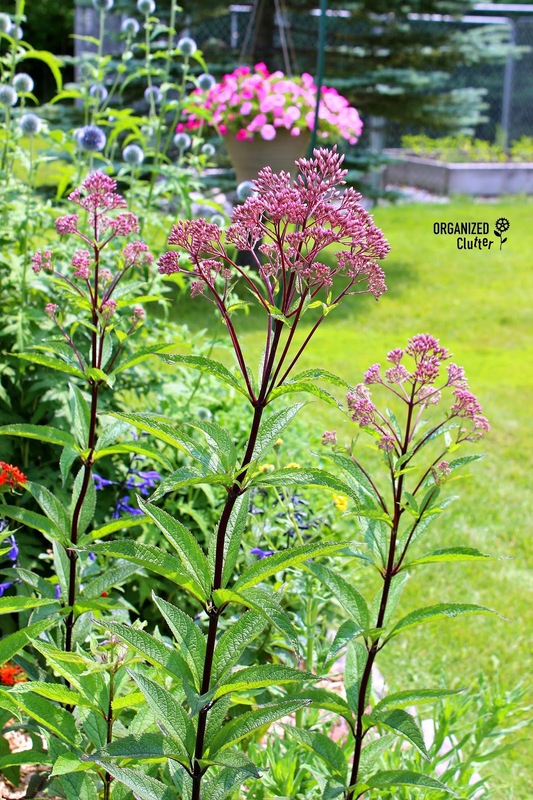 Also in bloom is Baby Joe Pye Weed. The globe thistles are near bloom at the rear. 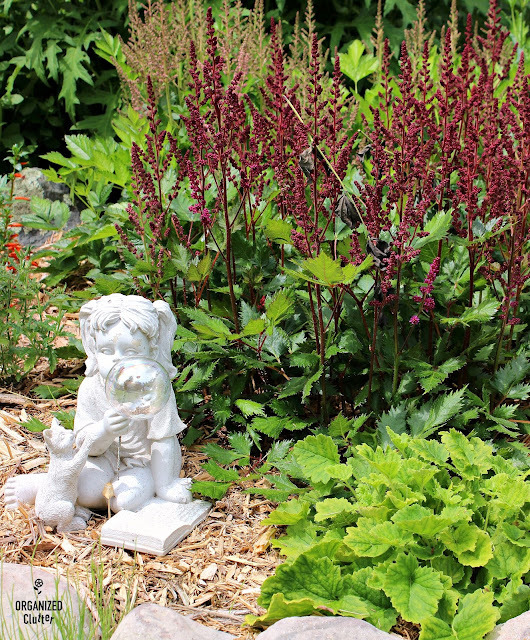 Behind this sweet little girl figurine with book and kitten, are two colors of Astilbes. A "firecracker" annual is planted in the lower left and just beyond the dark red astilbe are zagreb coreopsis just coming into bloom in yellow. 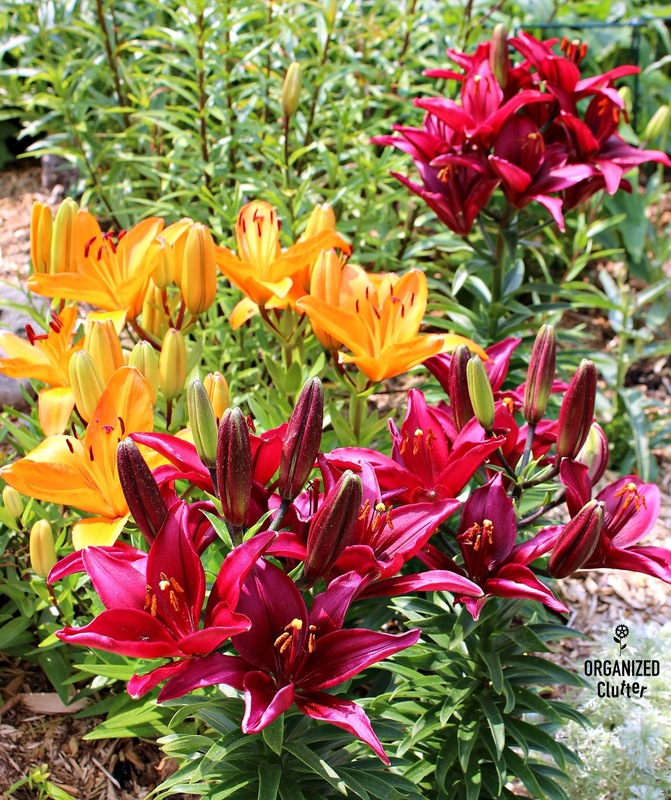 Asiatic lilies are one of my very favorite summer flowers. 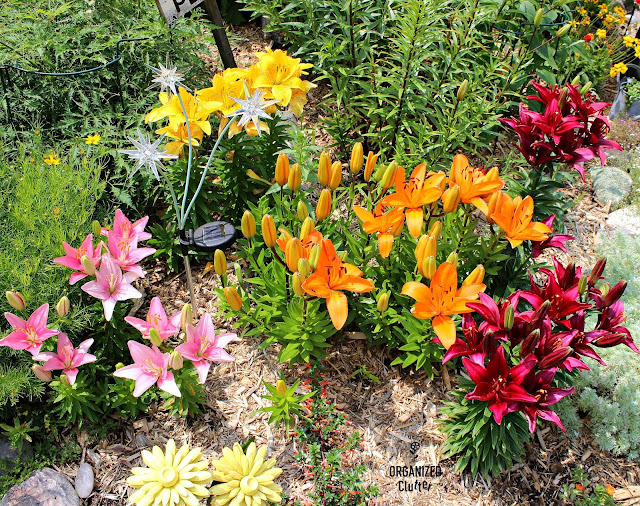 Sue's Asiatics provide such a rich pop of colors to the flower garden. Between the pink and orange Asiatic is a Solar Star Color Changing Garden Stake providing light and interest to the evening garden. The Orange lily is Tiny Dino, the little pink one is Tiny Icon, and the burgundy one is Tiny Ghost. The peonies are all done blooming for this year but the plant is a very healthy bush in the center of the garden. Iceland poppies are just coming into bloom at the lower right. 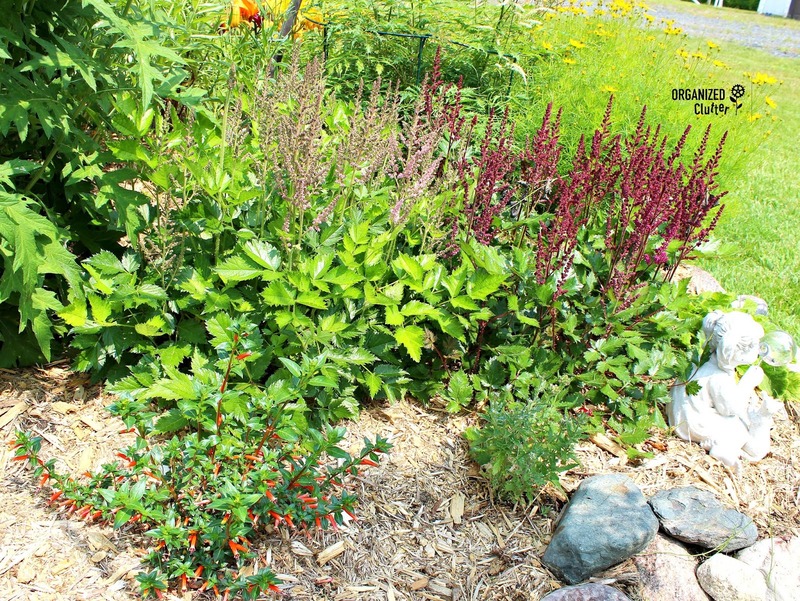 To the far left the wispy blossoms belong to a perennial Goatsbeard Kneiffii. 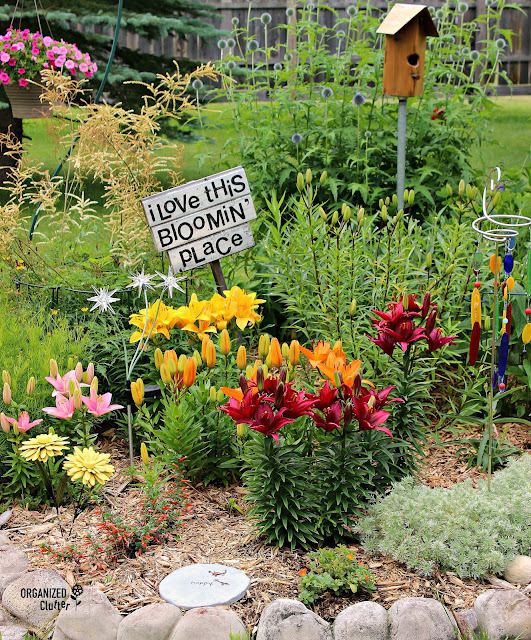 There's always something blooming in this "Blooming Place". 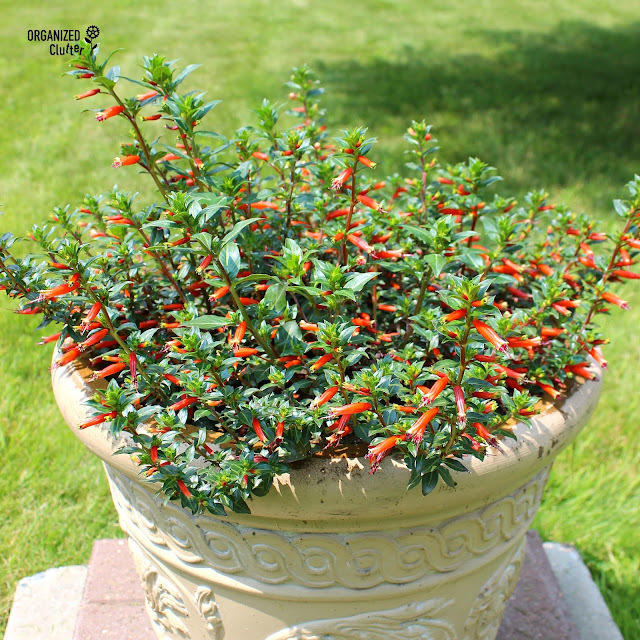 Have you tried the "Firecracker" plant? 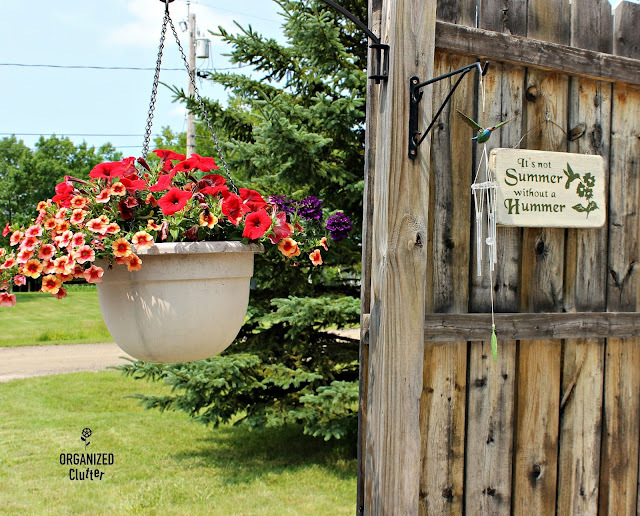 Grown as an annual here in Minnesota. It's loaded with little firecrackers! 1. 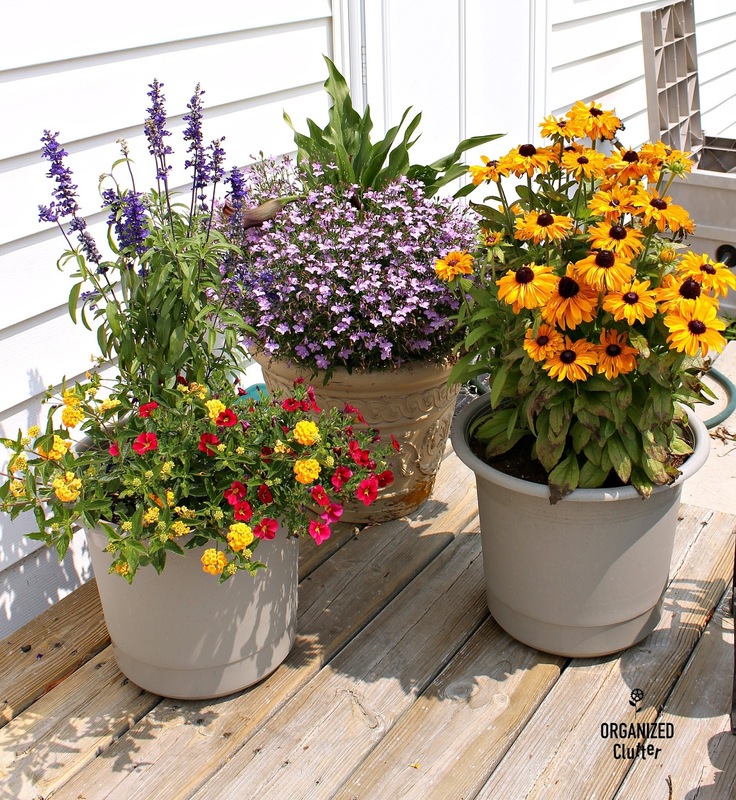 Yellow lantana, calibrachoa, and salvia. 2. Techno Heat Lobelia, and a Calla Lily. 3. Annual Black Eyed Susans. I have always loved these white sleeping angel figurines. They also have held up well on the deck around container gardens. 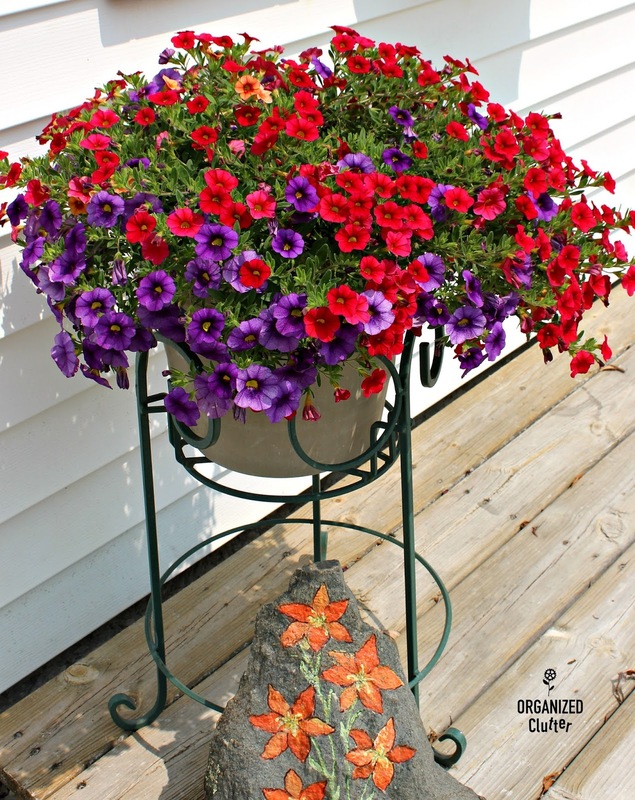 When Calibrachoa are at their best, like these, they are magnificent! More calibrachoa and petunias. 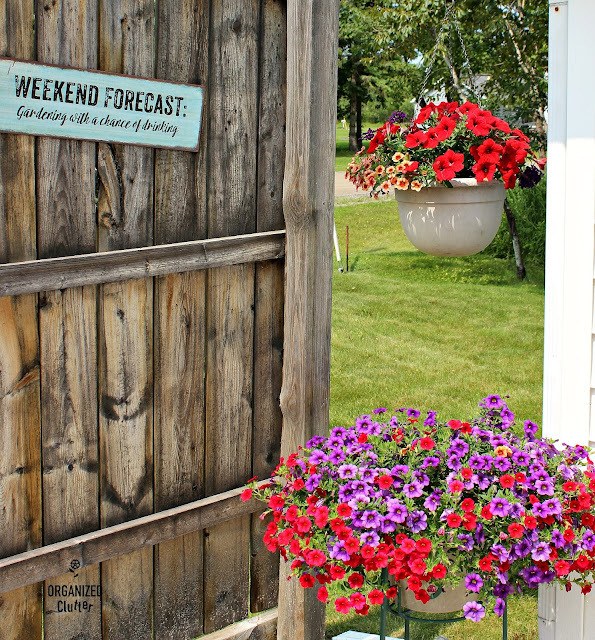 The fun sign "Weekend Forecast: Gardening with a chance of drinking!" is from this season and made by Ganz Gifts. 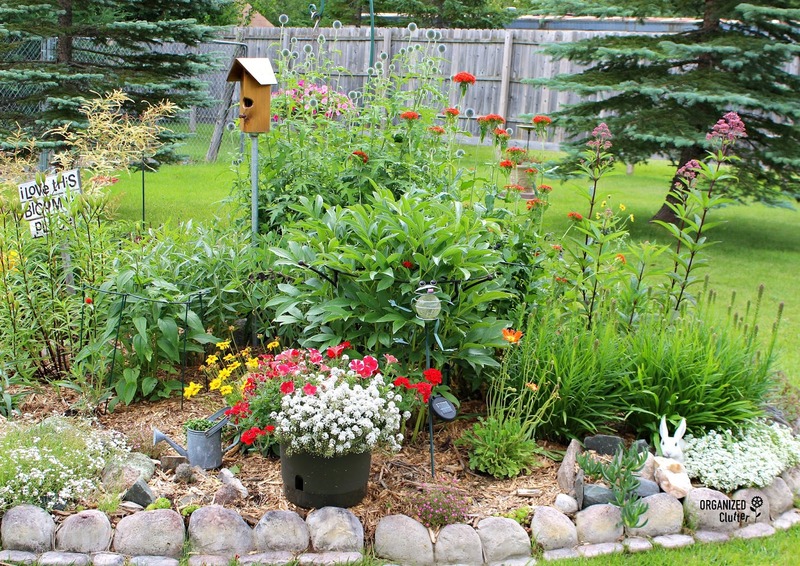 Humming birds should abound here with all of Sue's bright red blossoms to draw them in! I hope you enjoyed the tour and gained a few new ideas too.